I started the day at work but was asked to leave a moment later as a rash on my hand from too much weekend cleaning was mistaken for hand foot and mouth disease. As it is super contagious obviously no one can have anything like that and be at school. Didn’t even have time to get a pic before I was sent home! Needless to say, once you see the pic, I left the top of my work outfit on – Zara and birthday necklace – and switched to Sportsgirl shorts on the bottom because it was hot. Then I finished the massive “To Do” list of things that didn’t get done amongst all the washing and trips up and down to the clothes line at the weekend. Oh and birthday partying at Radio Lollipop. I was totally in business mode up the top where it counts and chilled and cool in the bottom. Got lots done and got the all clear to go back to work. 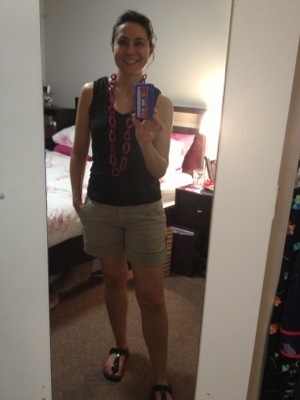 Posted in casual, fashion, Sportsgirl, work, Zara and tagged Mullet, Mullet workwear, summer. Bookmark the permalink.